Dundee United's David McCracken denied a makeshift Dunfermline side a surprise victory at East End Park. The visitors dominated for long periods but missed several chances after the Pars rested several players ahead of their Scottish Cup semi-final replay. Despite fielding a weakened side, the home side took the lead through Greg Shields shortly before half-time. Marco Ruitenbeek looked set for a clean sheet in his last game for Dunfermline only for McCracken to equalise late on. Dunfermline manager Jimmy Calderwood made six changes ahead of Tuesday's Cup clash with Inverness. Strikers Patrick Clark and Craig Wilson were given first-team debuts while veteran goalkeeper Ruitenbeek was also handed his first start of the season - and his last ever for the club before returning to the Netherlands. David Grondin, Sean Kilgannon and Darren Young were also drafted in as the likes of Stevie Crawford, Craig Brewster and Andrius Skerla were rested. 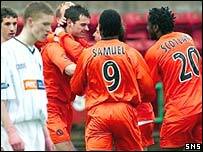 For United, boss Ian McCall decided to drop striker Jim McIntyre, replacing him with Jason Scotland. The visitors began brightly, David McCracken heading just over from a Mark Wilson free-kick. Wilson then unleashed a fine drive that Paul Gallacher did well to parry before Craig Easton pulled a shot wide. Ruitenbeek tipped an Andy McLaren shot over just after the half-hour mark as the visitors continued to press. But, 30 seconds into injury time, they failed to clear Gary Mason's cross from the right and Pars right-back Shields lashed the ball past Paul Gallacher. Calderwood replaced Wilson at the break with Gary Greenhill in a bid to close down the space afforded to Derek McInnes and Easton in midfield. But United continued to dominate, substitute Collin Samuel combining neatly with Scotland, who forced Ruitenbeek to tip the ball round the post. The visitors finally equalised in the 64th minute, when Billy Dodds headed the ball back across goal following a corner and McCracken stabbed the ball home. Samuel then blasted a powerful effort straight at Ruitenbeek before Scotland forced the goalkeeper into a fine save. Dunfermline: Ruitenbeek, Shields, Tod, Labonte, Grondin, Craig Wilson, Darren Young, Mason, Kilgannon, Mehmet, Clark. Subs: Scott Y Thomson, Nicholson, Dempsey, Greenhill, McGuire. Dundee Utd: Gallacher, Wilson, McCracken, Innes, Archibald, Easton, McInnes, Dodds, Robson, Scotland, McLaren. Subs: Jarvie, Duff, Samuel, Holmes, Conway.